The rooms in our baby nest are quiet, small and cosy. This is because your baby has come from a very small space in your body, where she/he was kept cosy and warm for quite some time. Following birth, your baby then spent a lot of time in the familiar surroundings of home. Moving to another new environment, with lots of strangers around can be very scary if you’re a baby. 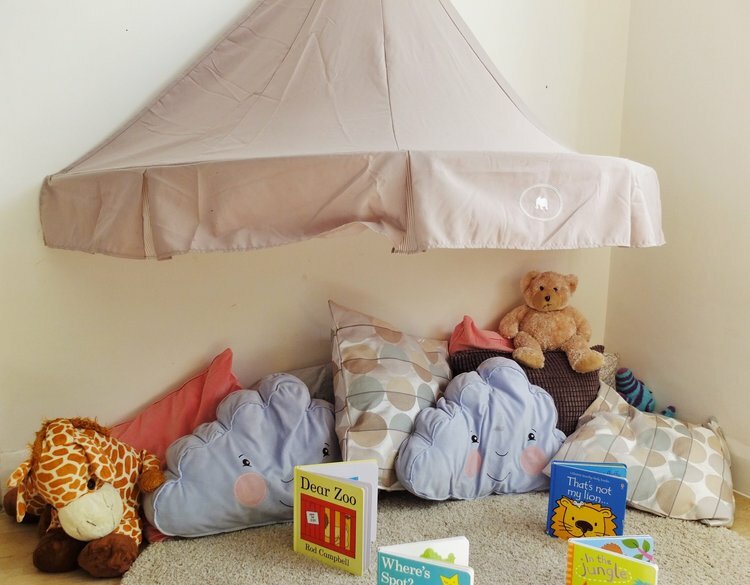 That’s why we have ‘snuggle rooms’ alongside the main room; to allow your baby to spend time with her/his dedicated ‘play partner’ in a cosy space, away from all of the hustle and bustle of a busy baby room. We try to provide a ‘home from home’ environment, where your baby can get to know your play-partner really well; more importantly, your play partner can get to know your baby, their likes and dislikes, routines and habits. That way, we can be sure that your baby will settle into nursery life and feel loved and cared for. Our Baby Nest is also well away from the rest of the nursery. This means that there is no ‘through traffic’ that will cause your baby to be distressed and worried. Sometimes our baby nest is situated upstairs; sometimes in a quiet area of the nursery, but we always try to make sure that the space is quiet and calm. Our Baby Nest practices are research based (Bowlby and his theories on early attachments, 1969). This research tells us that where babies and children form strong attachments early in life, they go on to be secure, confident adults who form good relationships with others. That’s why your baby will be allocated a play partner from the moment you register with us. The play partner will be the person who supports your baby’s play and learning and will give them the cuddles and care they need in your absence. Babies (and children) learn through their senses. Your baby’s sense of smell is very strong after birth and continues to be one of the strongest senses (alongside taste) that they use in their daily lives for. Is it any wonder then, that they can smell their mother from before birth and know you by their sense of smell and taste? We want to build on this and will provide you with a ‘baby scarf’ and ‘comfort blanket’ for you to ‘fill with love’ when you register with us. You and your partner can wear them close to your body and get your smell embedded into the fabric—fill them with love. We support you and your baby and adapt the settling in procedure to suit your individual needs. Ideally, you should be prepared to stay with your baby for the first two or three sessions, which we suggest last up to an hour. The next stage is to leave your baby with his/her play partner or buddy play partner, for about 15 minutes then extending to half an hour before you come back. You should extend the length of time you leave him/her for until it becomes an easy process. When you greet your play partner, try giving them big smiles and maybe even a hug. This is called giving your baby ‘cues’. She/he will take his cues from you and if baby sees that you think the play partner is a person to trust, they will learn to trust her/him too. Your baby’s play partner will wear the scarf you’ve filled with love and this will remind your baby that you are close at hand. When we put your baby into the coracle or cot to sleep, we will put the tiny comfort blanket next to his/her face so that your scent provides extra comfort. Babies in our baby nest, sleep in the same room as their play partner and other babies. They’ve been used to the sounds from your womb and then the myriad of household noises, so a quiet space could be quite scary. Also with the babies all in the same room they don’t feel alone and we can keep an eye on them when they’re sleeping. If you have children in other rooms in the nursery, talk to us about making time for your baby to connect with his/her brother or sister. It’s important that they spend time together during the day. Maintaining family bonds are crucial for both the baby and their siblings. Please let us know all your baby’s special habits and likes/dislikes so that we can help them and you, to settle into nursery life smoothly and trouble free.